The true-color image above shows a patch of bright water off the coast of Chincha Alta, Peru, roughly 200 km (124 miles) south of Lima. The scene was acquired on February 23, 2004, by the Moderate Resolution Imaging Spectroradiometer (MODIS) aboard NASA’s Aqua Satellite. 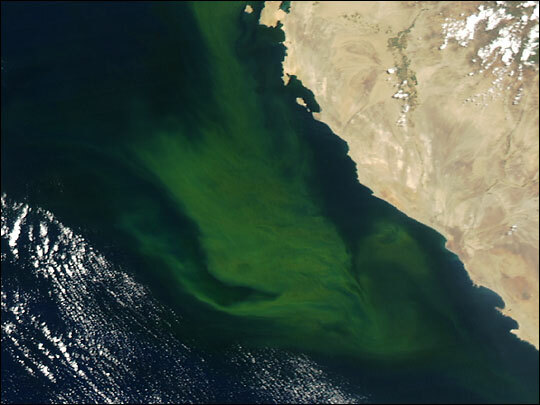 The bright yellow-green coloration of the water is probably the result of biological activity—possibly some species of algae. The waters along the west coast of South America are some of the most biologically fertile in the world. This is due mainly to the Humboldt Ocean Current—a very cold, deep current flowing from Antarctica past the southern tip of Chile and northward to Peru. Off Peru, the icy waters of the Humboldt Current upwell and bring a steady supply of sulfates and phosphates from the depths to the surface. With an abundance of these nutrients brought up to the surface, a wide range of tiny ocean organisms flourish and reproduce in great numbers. Among these organisms are diatoms, phytoplankton, and zooplankton—collectively, forming the foundation of the marine food chain. Most of these organisms are benign to their environments. However, some species can be poisonous to unsuspecting organisms that may feed on them, including fish, shellfish, and, indirectly, even humans. About 20 percent of the world’s commercial fish yield comes from the Humboldt Current’s marine ecosystem, including sardines, anchovies, and mackerel. 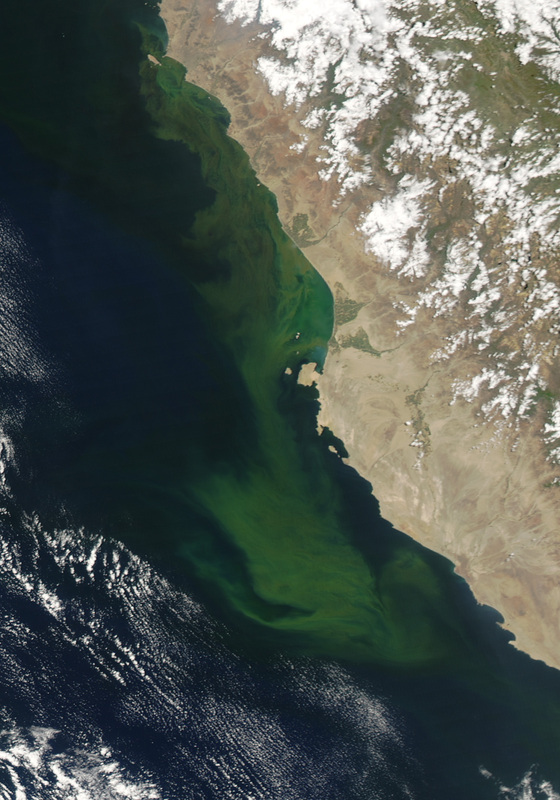 It is hard to identify exactly what is causing this bright water patch off Peru using only satellite data. While scientists continue to refine their algorithms in hopes of one day being able to accurately diagnose such events from space-based remote sensors, today the only way scientists can be sure is to collect water samples from the event while it is ongoing.